The Forest Hill loss Sat in Jacksonville, makes Oxbridge only undefeated left. Dwyer, St Andrew’s move up. Lakes 0-3 week against top 5 teams. #1 Oxbridge Academy - The Thunderwolves stayed undefeated winning three times on the week including a 52-46 comeback victory over district rival Cardinal Newman Friday night. 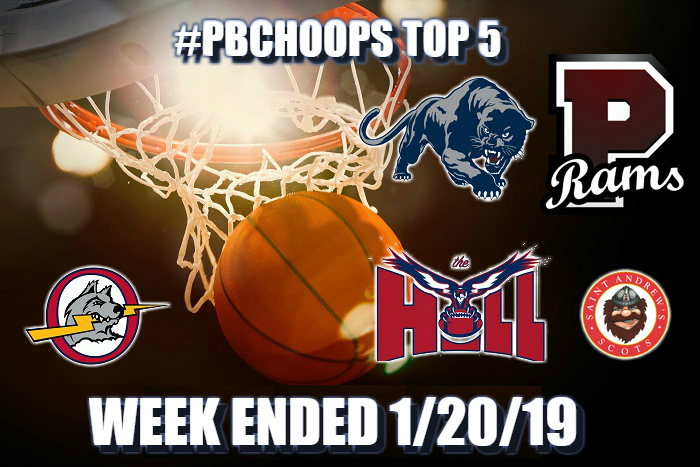 #2 Forest Hill - Forest Hill took home the victory in the highly anticipated game of the year so far with Palm Beach Lakes Tuesday. The Falcons followed that up with a trip to Jacksonville for the holiday weekend where they would face some of the top teams in the state. In the end they suffered their first loss of the season to the state #19 ranked Jacksonville-University Christian on Saturday before closing out the event Monday with a win over powerhouse Potter's House Christian. #3 St Andrew's - The Scot's move up one spot after another solid victory over a talented Coral Springs Charter team Thursday, that win made even more impressive after Charter took down Miami-Norland Saturday night. #4 Dwyer - Mentioned last week that the Panthers seemed to be hitting stride after a very difficult schedule to start the season. It all came together Friday when they jumped all over rival Palm Beach Lakes and followed that win up with a buzzer beater victory over IMG Saturday. #5 Palm Beach Lakes - The Rams went into last week with a huge task, 3 games against 3 of the top 5 teams in Palm Beach and Broward. After a gut wrenching loss against #2 Forest Hill Tuesday, Lakes ran into a hot shooting Dwyer team Friday and highly talented Dillard squad Saturday. Lakes finished the week 0-3 but stay in the top 5 based on their body of work. After a tough week the Rams head down to Boca to face a solid Olympic Heights team looking to make a statement after a couple of close district losses. This should be a highly competitive game. Santaluces is undefeated in district play at 8-0 but quietly Park Vista is setting in the #2 spot at 5-2. A win by the Cobras would be big for their confidence come district playoff time. While not a big name, big school matchup this game could be a very interesting and high scoring game. Both teams feature players that can light up the scoreboard. A huge district game in more ways than one. Royal Palm is an extremely talented team that has been through alot this season so far both on and off the court, however they always show up for the big games and there is none bigger than facing the #2 Falcons on their home court. A rematch from December that ended up going down to the last shot. The Chargers are looking for payback and both teams are looking to finish off strong. Every year around this time the Lancers begin to put something together. This game will feature two of the hottest players in the county as junior guard Jevon Allen matches up with senior guard Trent Webb. Allen is on a scoring tear averaging more than 27 points per game over the last 5 for the Lancers while Webb is averaging more than 17 points per game on the season. The Tigers continue their history of scheduling tough opponents as they head to West Palm to take on Palm Beach Lakes.